We are happy to announce the addition of a new farm hand. Her name is Onyx and she is one lucky dog. I almost hit her coming home last weekend, she was wandering in the middle or the road, cold, wet, and shaking a bit. She looks to be about 6 weeks old and some sort of lab mix. 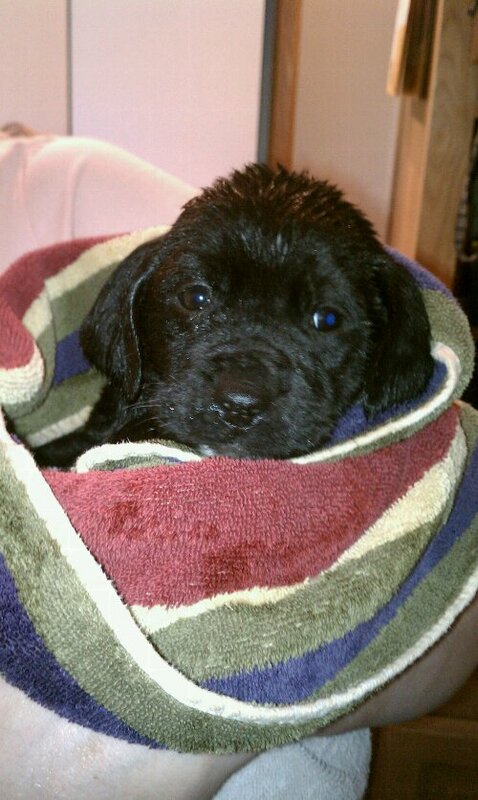 The picture makes her hair look curly but that is just from her bath. We attempted to locate an owner with no luck (I am pretty sure Ellen and Izzy were praying for this), so it looks like she will be staying with us. This is a good thing because I need somebody to keep this blog updated better than I have. Once she is house broken I am going to work on her typing skills. It has been warming up a bit and I am getting ready to start seeds for the high tunnel and get more berries ordered. I was getting very excited because I have no construction projects going on this year to delay planting. However, this was before the wind storm this week that blew out the end of our large tunnel. I have a fix in the works for that, but I will cover that in another post. This entry was posted in Critters and tagged Onyx. Bookmark the permalink.